Sometimes a form of quackery is promoted with such a breathtaking arrogance, duplicity, and disregard both for the truth and for the lives and welfare of potential victims that it almost defies belief. The parlour trick of pretending to test muscle strength by pushing against some muscle group and then doing it again under supposedly different circumstances is well known. I demonstrate it as a part of talks I give on quackery, where I ask for a volunteer from the audience and test how hard it is to push down an extended arm while they are holding something in the other hand. The test is then performed again with them holding something else and this time I can push the arm down easily. If the talk is being given in a dining room or in a convention hotel it is usually very easy to get packets of both sugar and an artificial sweetener, and I can show how sugar does not affect strength but aspartame makes you weak. If I ever have to demonstrate at a meeting of diet soft drink makers I will of course prove the opposite. It took very little time for me to learn how to do this, and I know of at least three methods of doing the trick. The trick is employed in several medical scams, where it is used to "diagnose" an illness which can then be treated by something which the tester just coincidentally happens to have available. It goes under several names, but the best known are probably "Contact Reflex Analysis" ("CRA"), "Applied Kinesiology", and "Nambudripad's Allergy Elimination Technique" ("NAET"). The first and last of these forms of quackery are claimed to be proprietary techniques, and trademark protection is even claimed for the names. The three techniques vary slightly (CRA can involve testing finger strength and other body parts, AK is used mainly by chiropractors and uses the whole arm, with the suspect substance sometimes held in the mouth, and NAET uses little bottles of packaged vibrations which have to be (expensively) purchased from the inventor of the scam), but all are based on the idea that certain things make you weaker and a ready cure is available from the quack (or the quack's friends). When I made a comment once about this in a newsgroup and mentioned how easy it was to learn, I was challenged by someone who apparently used CRA to rid her body of the poisonous mercury from her tooth fillings. She referred me to a web site which contained the testimonial below. This was written by someone who uses CRA to convince sick people that the other things she sells can cure what is wrong with them, and pretends to be a story based on actual experience. She also works very hard recruiting more people into the CRA cult, as becoming a practitioner is not free. The writer is either incredibly deluded or has the conscience of a sociopath. This particular article does not mention that she is a member of the board of the organisation promoting the CRA fraud. You will notice that she claims to be a PhD, but the brief biography of her on the main CRA site (since removed - PB April 2012) only mentions her Certificate in Massage Therapy and her Doctorate in Divinity granted by that internationally-recognised theological college, the Georgia Academy of Healing Arts. The complete article is reproduced below. The main site for this outrageous medical fraud can be found here. My comments are in italics. Many times I have been asked how I got into CRA. It began with a tragic story that started a little over 5 years ago. My husband, Lowell, was experiencing severe pain and numbness in his upper extremities. After consulting two physicians and upon examination by a Neurosurgeon, he was diagnosed as having two small bone spurs on the cervical spine at C5, C6, and C7. The Neurosurgeon informed us that surgery would improve his condition. He said this procedure was a "piece of cake." He would be in Monday and out on Tuesday. The following Monday surgery was started. Four hours later, the doctors aborted the procedure and advised us that it was too dangerous, they may nick the spinal cord. They then scheduled him for the following Monday for a spinal decompression. Four hours of surgery, then "Oops. Too hard. Let's wait a week". They must have been big spurs. The very next morning there was a cancellation in the OR. Again they took him in for the second surgery. When they returned him to his room, he was completely paralyzed on his right side, and both arms, hands and fingers were curled shut. He was in excruciating pain. He had also lost all of his fine motor skills. For some reason the surgeons wanted to wait a week before the next operation, but there was a slot free so in he goes. I suppose they didn't have to prep him because everything had been done the day before. He comes back worse and nobody seems to care. He was kept heavily drugged for days and many other complications arose. Twelve days later I had to threaten a lawsuit to get him released from the hospital and away from the drugs. I took him home. He was totally incapacitated, and could not even lift his arms to feed himself. Twelve days, then a threat of a lawsuit? Did anybody suggest suing the hospital for negligence or for making this poor man worse? Apparently not, and this in the land of instant litigation. We explored many avenues (medically) and the only explanation was "Diabetes Neuropathy Bilaterally." The last sentence on the doctor's medical report prior to surgery read "Healthy 65 year old male." We went to highly acclaimed major medical facilities, and they could not find a problem. U.C. Davis said maybe carpal tunnel surgery would help his fingers. Multiple treatments for many weeks at the therapy center certainly gave us no hope. Did he have diabetes when he first went into hospital? I thought he had stenosis. No wonder they couldn't fix his neck if the problem was really in the pancreas. Now it's in his wrists? If the problems with his hands were caused by the neck surgery, operating on his carpal tunnels would have no effect. The reason that the "highly acclaimed medical facilities" could find no problem is because there was no problem, assuming that any such facilities were ever consulted, which is doubtful given the inconsistencies in the rest of this story. We then began to explore alternative possibilities. We heard about CRA from Lowell's masseuse. She could not explain what CRA was but knew someone that could tell if the nerves were damaged. We went to see this doctor. She had attended a seminar a year prior where she had purchased the videos which she shared with me to learn about CRA. She tested Lowell that afternoon and used me as a surrogate. I borrowed her videos and that was the beginning of a most beautiful journey into the world of CRA. You have to read really carefully here, because you might think you have misunderstood my meaning. The term "surrogate" means that the tests were carried out on someone other than the sick person. That's right - the tests were done on Sybil to diagnose what was wrong with Lowell! This may sound like madness, but it is how this scam works. Babies can be diagnosed by testing mothers, and presumably dogs can be diagnosed using pet cats. You think I am joking about dogs? Keep reading. And those videos - they are products sold to CRA practitioners to increase the wealth of the ultimate scam promoters, just like the tools in a regular MLM. We immediately booked a flight to the next seminar, which was in Boston, Massachusetts. We arrived Friday evening with Lowell dressed in his braces, elbow-to-fingertips, with rubber bands that held his fingers up, and his walking was very clumsy. I thought that Lowell was "totally incapacitated". Perhaps that didn't include his legs. Remember that he hasn't had the magic treatment yet, just the "surrogate" testing. Dr. Versendaal tested him that evening, adjusted him, and worked with him again on Saturday. The apparent results and improvement in Lowell's condition, inspired us to continue the practice of CRA. What was adjusted? Surely not C5 to C7, with their still unresolved problems from the botched stenosis surgery? We attended seminars across the United States. We bought all of the videos, and studied hour after hour. We also purchased all of the nutrition and the Clarus Product that was available at that time. We worked on a daily basis and slowly made progress. Each day was a faithful challenge. And what is this Clarus Product? Why it's that other old scam, the Q-Link, that protects against EMF and the horrors of mobile phones. But if Dr Versendaal's adjustments were working and Lowell's problems were caused by damage to his spine/pancreas/wrists in surgery, why did he need protection from cosmic rays to cure him. I'm sure it cured someone else's cash flow problems, though. Two years into CRA, I was studying a video and saw Dr. Versendaal testing two patients. They turned out to have brain stem injuries. Their symptoms were so similar that I immediately tested Lowell and he tested positive for injury to his brain stem. Brain stem? What about the neck, pancreas and wrists that were paralysing poor Lowell before he was adjusted and freed from radiation? The real answer is that CRA will test positive for anything you want it to, especially if a "cure" is readily to hand. We saturated his system with the suggested nutrition for brain stem injury. We then attended a seminar in Denver. Dr. Corey Cameron-Cooper tested him and said he had blood clots. There we purchased our first Clarus Combo, which had just been introduced, and finally resolved the problem with the clots. We are so grateful for the Clarus technology that provided us the means by which to dissolve those blood clots. We continued to attend the seminars and Lowell continues to improve. We attended a Phoenix seminar where Dr. Versendaal found that Lowell had suffered a minor stroke on the right side of the brain. Dr. Versendaal resolved that problem on the spot. My passion was further ignited to forge ahead at full steam to learn this miraculous work. Nutrition now, is it? And what would this nutrition that fixes brain stem injury be? Now we get onto the sociopath bit. Anyone who suggests that a Q-Link device can dissolve blood clots is showing that they have absolutely no concern for the health of the person they are selling it to. All they care about is money. And suddenly it turns out that Lowell has actually had a stroke, which can be cured in minutes. Was this stroke on the right side related to the right-side paralysis he had before? I need to make myself very clear here, so that there is no ambiguity in what I am saying. The person who says that he can "resolve" a stroke "on the spot" is a liar. He is not mistaken. He is a liar. He lies to people by telling them that they have had a stroke (because nobody with a real stroke is going to be able to get near him), he pretends to cure them, he steals their money. On top of that, stories like this can make people believe that strokes can be treated by quackery, and anyone following this belief who has a real stroke could put off medical treatment until they are either paralysed or dead. Liars like this Dr Versendaal and like Dawn Hoezee who owns the name "Contact Reflex Analysis" are the vilest form of human life. They care about nothing except money. They care nothing for other people's lives. It is possible that Sybil Thomas, who promotes his disgusting nonsense, is just someone who has been duped into being a true believer. It is certain that her studies for her Doctorate in Divinity did not include any subjects related to ethics or morality. I felt that "my assignment" was to help Lowell return to perfect health. It has taken almost 6 years on a daily basis to improve Lowell's fine motor skills. Slowly, family and friends were totally involved in CRA with great success. We now have a full-time infusion practice. Her "assignment" was to invent a tale of a miracle in order to deceive and rob sick people. We can only hope that not too many sick people came into her clutches or those of the people she has helped train, and that the crime has therefore been limited to financial fraud only. Our heart goes out to Dr. Versendaal who has tirelessly worked with Lowell and continues to guide us. We also wish to give special thanks to Dr. Corey Cameron-Cooper for her concerted efforts through use of essential oils and manual manipulation to return the dexterity to Lowell's hands. Most of all, I would like to thank my husband, Lowell, for being the vehicle that catapulted me into the practice of CRA. To my two daughters, Kerri and Tamara, for their help and support with their father; for their endless support, encouragement, and love they continue to embrace me with on my CRA journey. I'm glad she thanked Lowell. Without the fabrication of his story, she would not have one of her essential marketing tools. Also, without the Clarus products, the videos, advanced nutrition from Biotics and the continued devotion of Dr. Versendaal, it would be difficult to evolve to my desired level of practicing CRA. Magic radiation protectors, expensive vitamin pills and access to a quack guru. All the things that an ambitious scammer needs. Finally, I would like to extend my deepest gratitude to Dr. Versendaal for not only taking on Lowell, but his dog, Spirit, as well. Spirit lost the use of his whole back end in late December 2002. I immediately telephoned Dr. Versendaal who graciously accepted my call and he recommended a protocol on a daily basis despite the fact that it was the holiday season and he was preparing for his travels to Africa. I spoke with him several times per day. In this short time, Spirit has regained most of his mobility. Thank you Dr. V.
I told you there was a dog story, didn't I? I wonder who (or what) Dr V used for a "surrogate" when diagnosing Spirit. His travel agent? His Mercedes dealer? He certainly didn't use his own conscience, because nothing that small could be detected by modern science, or even by the magic science which drives quackery and medical fraud. Sybil W. Thomas, PhD, Doctorate in Divinity, Georgia Academy of Healing Arts, specializing in healing counseling. She has been a CRA practitioner for 6 years. She has an infusion practice in Incline Village, Lake Tahoe, Nevada. © 1999 - 2001, Dawn R. Hoezee dba Hoezee Marketing. All rights reserved. Reproduction in whole or in part without permission is prohibited. 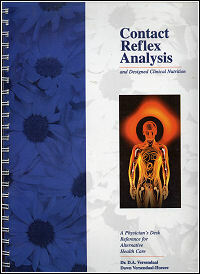 Contact Reflex Analysis and CRA are Service Marks of Dawn R. Hoezee. A chiropractor did not like what I said. I am not sure if I am at the right place or not since there is very little said at this web sight as to where or how to contact or make comments to. My wife and I have sent well over 100 people to our cra Chiropractor and everyone calls back feeling great. I told my cra doc that our 11 year old dog was starting to show signs of hip tightness. He suggested 1 calcifood a day from standard process: within five days our dog was fine and that is 4 years ago and he walks and plays just fine. My brother is 185% military disabled from agent orange. he is diabetic and end stage renal failure. I took him to my cra and within thirty days he came back with bloodwork within normal range. Hid kidney doc asked what he had done this past month to see such a remarkable change and when my brother told him the md said not to do what he said. I believe one dr. does not tell a person to not do what the other dr. has said. Anyways, he scared my brother half to death, I use to see that weekly at the dialysis center with treatment from the staff. My brother went off the program and has since been rushed to the hospital ay least ten times. My brother has been amputated. In one month my brother had feeling back in that foot, with the md running the show he lost the leg. The real truth is md run insurance income to the till with no regards to patient healing. My Cra has gotten more than one patient off of dialysis and off all Diabetic medication. You show much foolishness and an evil heart trying to dissuade people when you do not understand what you are talking about. Have you ever heard of acupuncture, please read on what that is and then come back to follow up. Acupuncture has been used for a very long time and no one denies its viability. I have seen on T.V. medical channel examples of operations using no medication only the needles to stop pain. You turn a switch on and you turn a switch off. What in the world do you think CRA is? turning switches on and off. You have no bus. in the health care field. Here is an email supporting one of the most disgusting medical frauds I have ever come across. I just ran across your site this evening. A friend had told me he was using CRA, felt healthier, and said I should try it. I didn't even know what CRA stood for. Some googling, and I found several sites, both for and against. But yours kind of blew me away. No problem, my wife won't let me go there, she knows the doc (Chiropractor) and doesn't like him. His wife died, and my wife blames him, for not letting her get treated for her cancer.